Isn't it funny how little experiences can change your whole approach to life? That time you were almost slammed into on the street making a left hand turn has you never turning left again. See what I mean? The first time my husband and I visited Mexico many years ago, we were in Puerto Penasco. Even though the gulf was blue and people were lovely, the 10,000 plastic bags and Styrofoam boxes that were hiding under the cactus and hanging from every bush and telephone line had us wondering about plastic in general. We came home fearful for how the landscape everywhere in the world was going to look if we continued to waste everything we lay our hands on. Then the recycle/reuse became a way of life. Plastic bags were replaced by market bags and styrofoam was banned. But, as hard as we tried to avoid bringing bags home, we would still end up with plastic bags that we couldn't in good conscience throw away. So we started in saving them, bags inside bags hung over more bags inside more bags. We vowed to take them back to the grocery so the grocery chain could throw them away. But we never did. We have so many bags I have designated a corner of the laundry room for their storage. 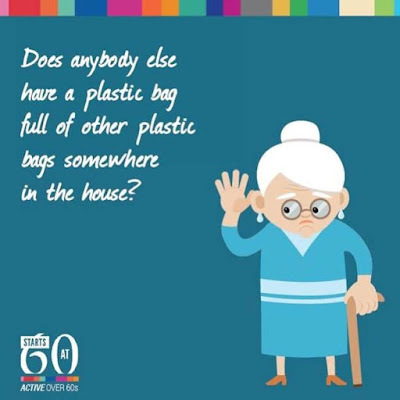 Evidently little old ladies (like me) are crossing over the line between being sensible a citizens and hoarding plastic bags. I promise to be better in the future...in meantime does anyone else have a plastic bag full of other plastic bags somewhere in the house? I am just wondering! Ya got it all wrong! The first step is to buy a dog. THEN you have a good excuse for keeping all those bags! Oh, and having a dog is nice when your husband asks, "Who are you talking to?" Well I fold mine up into a triangle shape and store them under my sink in a empty Kleenex box. This way I can grab one if I need it to put in the bathroom garbage can.